Breakfast is probably the most important meal of the day. After all, you literally break a fast, fueling your body for the day ahead. Many people skip breakfast, especially if they're trying to lose weight when, in fact, a more sensible strategy would be to skip dessert or late-night snacks. Others miss breakfast because they're just too busy. Unfortunately, this sets us up to grab anything and everything when hunger pangs finally kick in. So begin your day right and spend a little time eating a healthy breakfast, even if it means a little planning ahead. Your body will thank you. Whip up a batch of pancakes in no time with this basic pancake recipe. You can add chopped fruit and complementary spices like pears with cinnamon to the batter. Enjoy with a drizzle of good-quality maple syrup. French toast is a favorite weekend breakfast for many people. If you're concerned about fat and cholesterol, use egg substitute or a combination of eggs and egg whites in place of whole eggs and a dairy-free milk substitute. These delicious cranberry orange muffins have just the right balance of sweetness and tartness.​ Low-fat muffins can be light and fluffy if you know how to measure flour. Just make sure you spoon the flour gently into the measuring cups and level with the back of a knife. Resist the temptation to scoop the cups into the flour and pack them full. Crêpes are thin pancakes that can be eaten in the same way as pancakes or rolled up with a filling of your choice. If nothing else, enjoy them with a sprinkling of confectioners' sugar and a squeeze of lemon. Dress up your oatmeal and add an extra nutritional boost with canned pumpkin purée. This makes a great dessert any time of the year, but especially in the fall. This thick and creamy pumpkin smoothie is like chilled pumpkin pie in a glass but without the fat and calories. It makes a delicious and filling liquid breakfast or an energy-boosting snack. 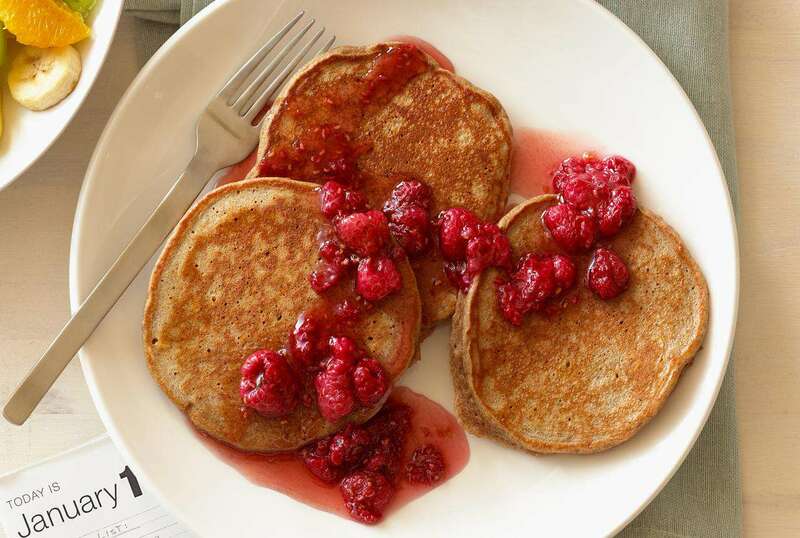 If you're a pancake lover, try adding a little extra fiber with yummy applesauce oatmeal pancakes. Resist the temptation to top them with butter. A little maple syrup is perfect, or try some warmed applesauce and a sprinkling of cinnamon.